John Philip Ray - Dr John Philip Ray has taught history for forty years. In 1988 he retired from a large secondary school in Kent to undertake postgraduate research on Air Chief Marshall Sir Hugh Dowding and the Battle of Britain. 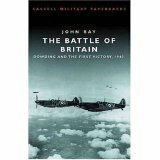 His subsequent book The Battle of Britain: New Perspectives, published in 1994, sought to re-examine the complicated political and military background to that most important struggle. He is author of more than thirty earlier books, mostly for secondary school students preparing for examinations.